Rockitecture provides large entrances signs for subdivisions and businesses all over the United States. These durable stone signs are meant to withstand the elements in all different kinds of climates. The stones can weigh as little as 1,000 pounds, and we have access to stones as large as 40,000 pounds from the sandstone quarry we work with in the Treasure Valley. Contact us to get a proof and quote for your project. Call, CONTACT US or visit our showroom to discuss your project with a Rockitecture representative. Choose a type stone. We typically use sandstone or granite that is quarried locally in Idaho. The sandstone can be easily cut to the shape and dimensions required for your project, so it is not always necessary to pick the exact piece of stone before we do a mockup. Our designer will provide you with a proof either through email or in our store. Approve your design or request changes through our online system. Once the design is approved the stone goes into production. 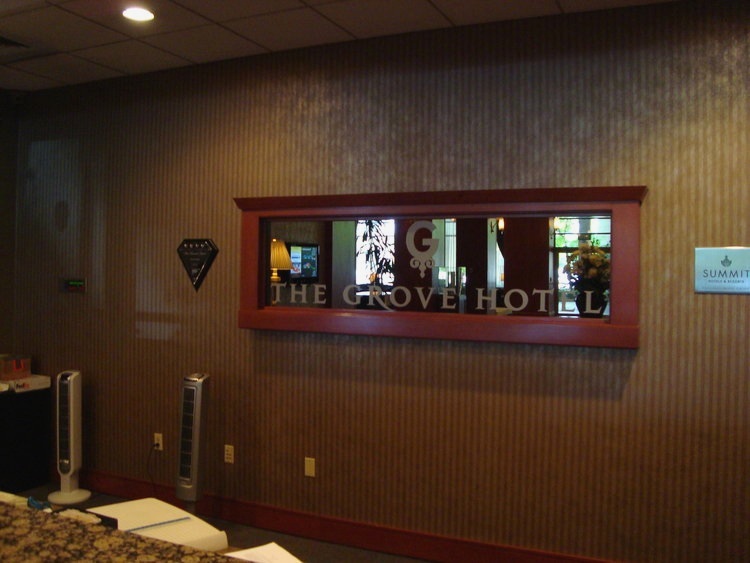 Sit back and relax while our experienced engravers produce your custom sign. After about two to three weeks, you will receive a call that your stone has been completed. At this point you can either pick up your stone or schedule delivery. Rockitecture can deliver and place your stone anywhere in the Treasure Valley, or use one of our LTL carriers to ship it out of the area for you to place it. Local deliveries usually cost around $300-$500 for a 1,000-10,000 pound stone. Deliveries for larger stones are quoted on a case by case basis. This sign is composed of three large (45,000 lb.) 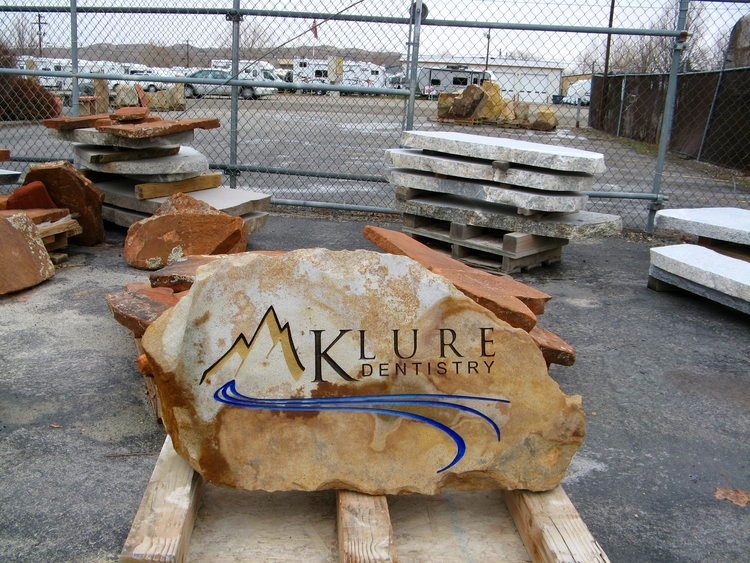 sandstone boulders that were shipped to North Dakota and combined to make one large stone sign. This Table Rock Sandstone sign was crated and shipped to Texas. 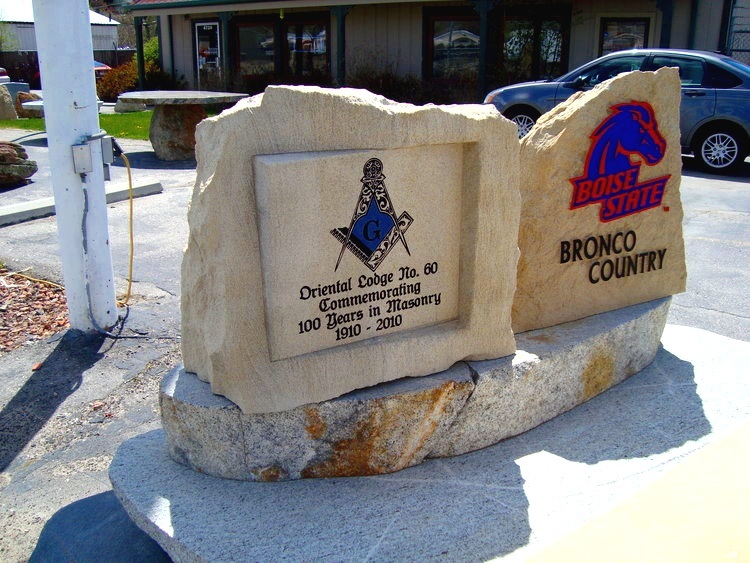 This multi-colored stone sign is located in Garden City, ID. Rockitecture provided this multi-colored entrance sign that was shipped to Sun Valley for this landscape company. This Table Rock Sandstone sign was moved from job to job to advertise the company’s work. These signs are located in Qwest Arena (now Century Link) to show their main corporate sponsors. 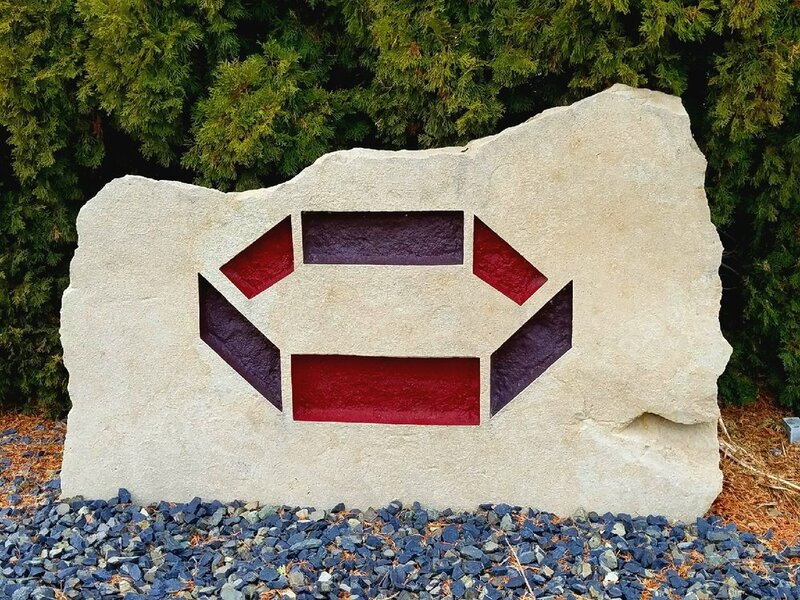 This multi-colored sign was engraved into Table Rock Sandstone for this winery. Oregon Sandstone was used to create this business sign. 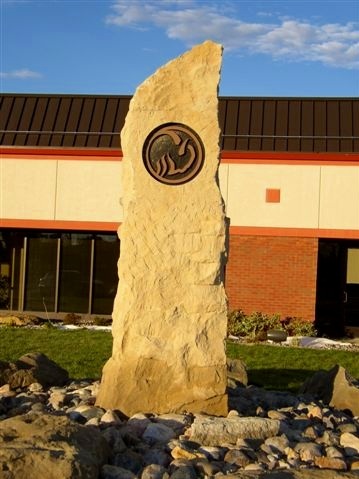 This Table Rock Sandstone sign was shipped to North Dakota for this credit union. This Table Rock Sandstone shipped to North Dakota for a credit union. Winecup Gamble Ranch is one of the largest ranches in the U.S at over 1 million acres. Two signs were delivered to rural Nevada and placed approximately 45 miles apart at different entrances. Rockitecture contracts with a local crane company (Crane Services/Welding Unlimited) who can place stones at a distance of a few feet up to 30 feet, depending on the size of the stone. This multi-color sign is located in Nampa, ID. This entrance sign was delivered by Rockitecture and Crane Services to Caldwell, ID. 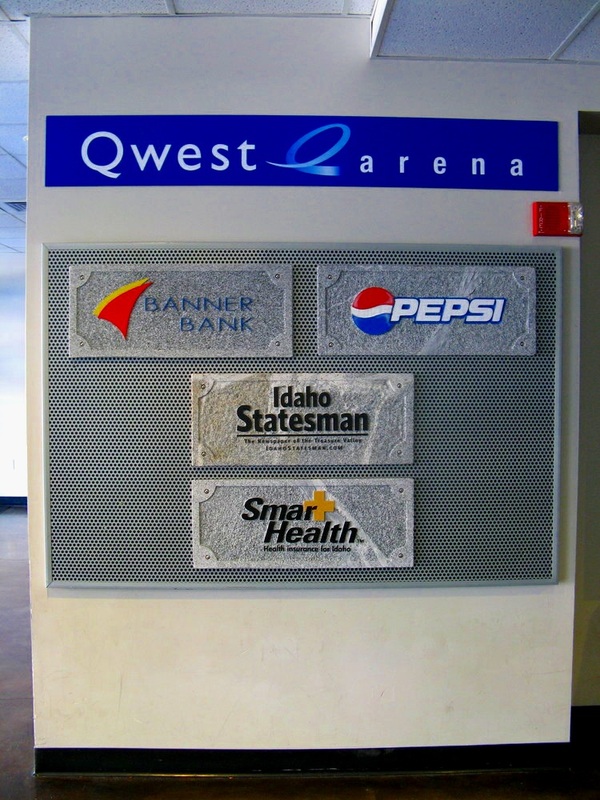 This granite sign was placed at Century Link Arena as part of their corporate sponsorship program. This sign was placed at a Boise Rescue Mission site to recognize the major donors for their project. This sign was delivered and placed in Boise, ID. Table Rock Sandstone was used to create this multi-colored sign. This stone sign was placed at a water treatment site as their entrance sign. 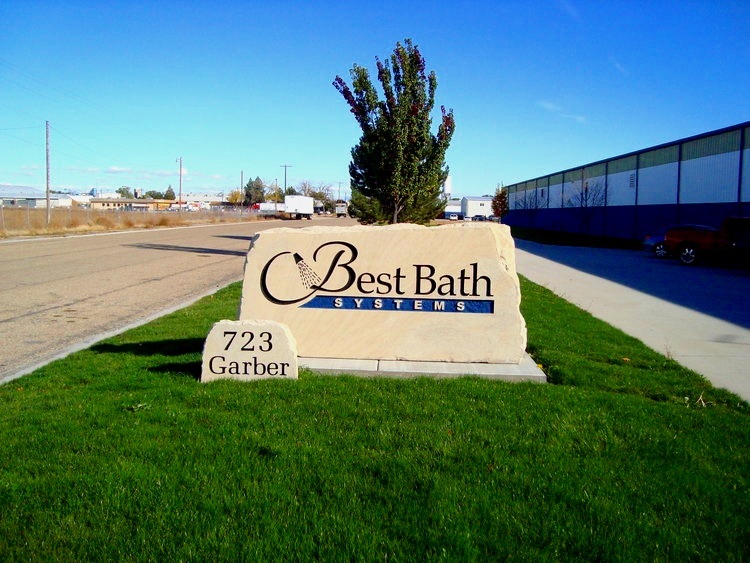 Table Rock Sandstone was used to create this large business entrance sign in Nampa, ID. This sign was created and delivered by Rockitecture to this business in Garden City, ID. This stone sign was delivered and placed in Fruitland, ID by Rockitecture, and was created using local, Table Rock Sandstone. This entrance sign was engraved by Rockitecture into Table Rock Sandstone, and then picked up by the customer at our location in Garden City, ID. This logo sign was located at a data site as a subtle entrance sign with just the company’s logo. Many of these granite signs were engraved by Rockitecture, and then placed into masonry by a stone mason. 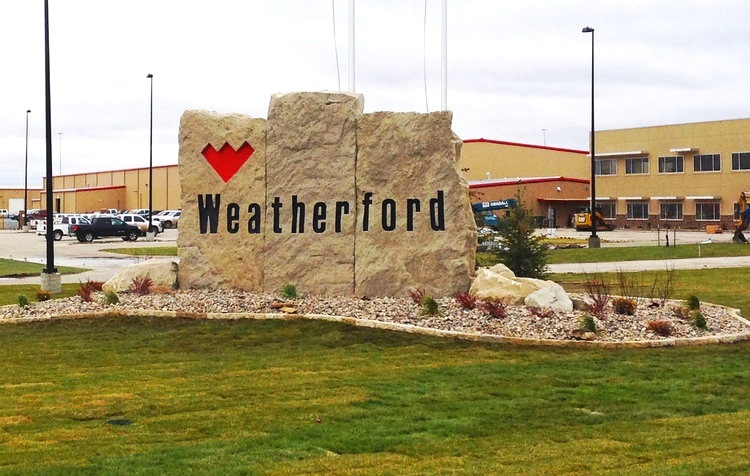 This sandstone sign was created to be put in front of completed jobs to advertise the company’s work. Rockitecture works mostly on stone signs, but does glass etching for large glass signs. Rockitecture engraved sign foam for this business logo that was then applied to this larger entrance sign. Multiple companies are located at this same location, so each logo was engraved into this stone by Rockitecture. An area for this company’s logo was inset and engraved into this Table Rock Sandstone boulder by Rockitecture who delivered the stone to Garden City, ID. Oregon Sandstone was used to create this custom sign for this dental practice. 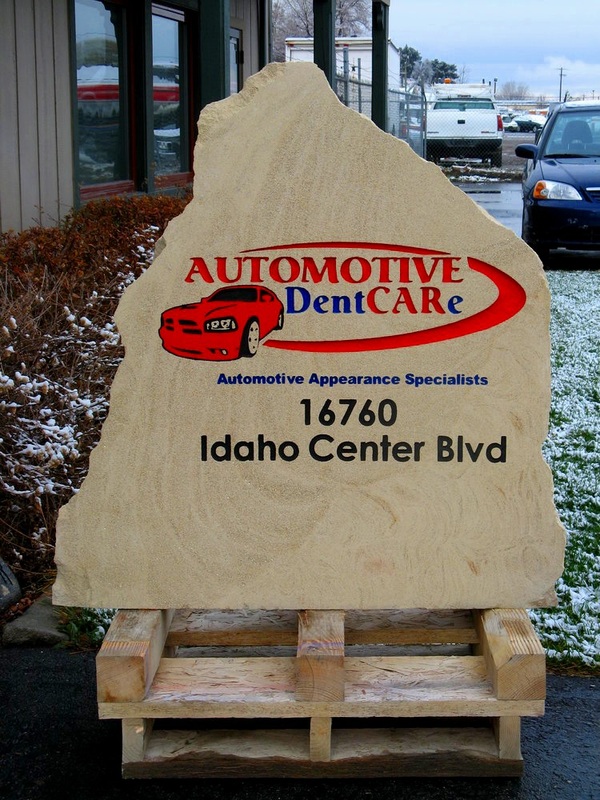 Rockitecture uses Idaho Granite to create unique business entrance signs. Rockitecture was asked to make a stone sign that looked like “part of the stone was pulled out from the rest of the stone” to create this custom entrance sign. Table Rock Sandstone entrance sign. 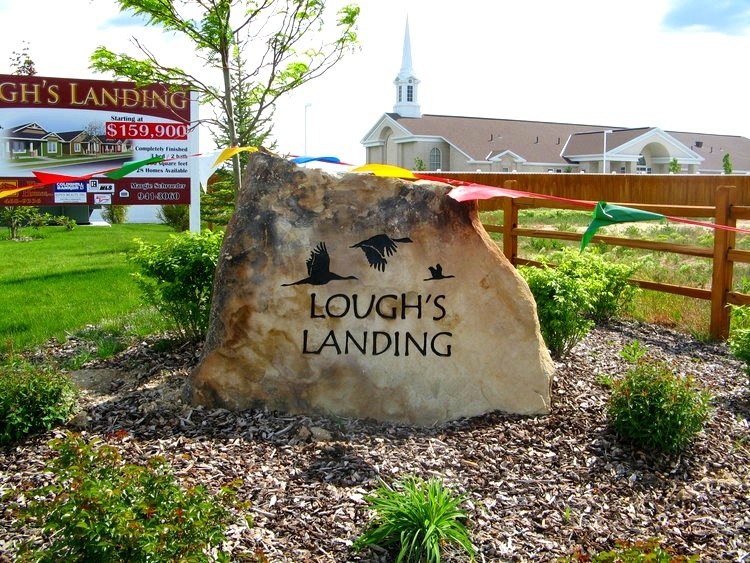 A Table Rock Sandstone boulder was used to engrave this custom entrance sign. A combination of Table Rock Sandstone, engraving and metal letters were used to create this entrance sign. Two large Table Rock Sandstone boulders were used to create this sign at the entrance to Pine Tree Village. Rockitecture created this sign out of Table Rock Sandstone, and set it using our crane contractor, Crane Services. Rockitecture can fabricate stone signs from small or large Table Rock Sandstone boulders, such as this sign for Saddle Brook. 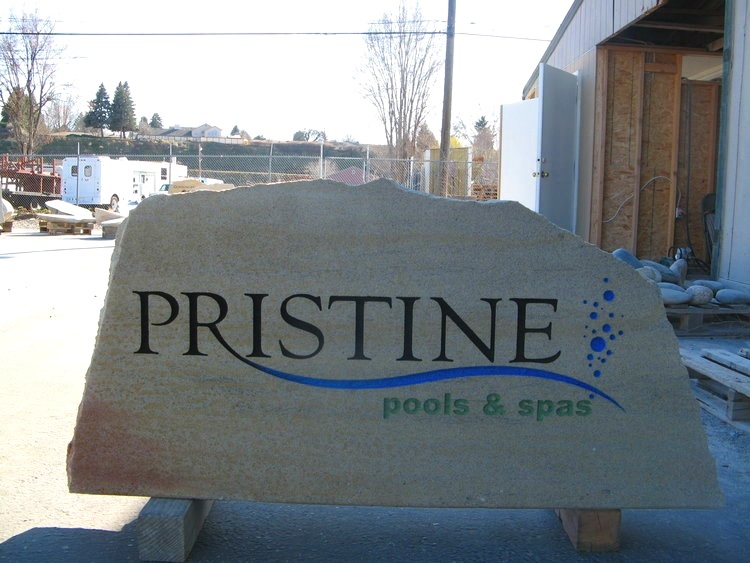 Each stone sign produced by Rockitecture is custom-designed based on the customers’ feedback. Contact us today for your custom design. 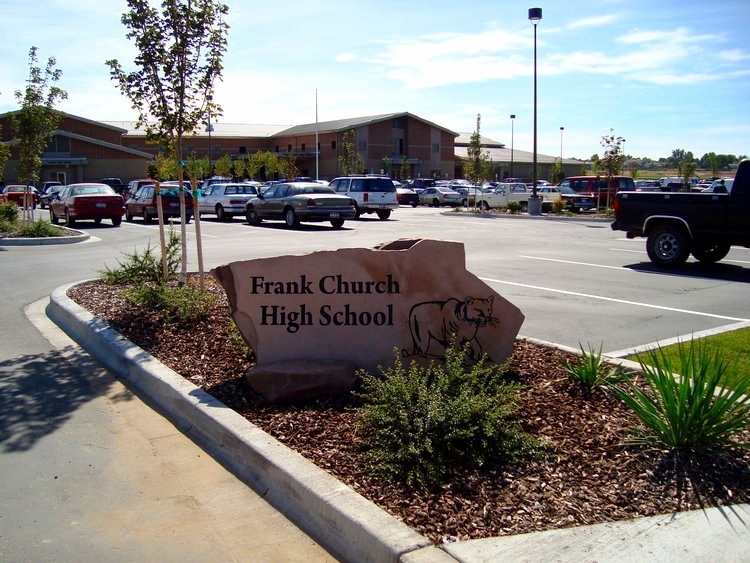 Each Table Rock Sandstone sign is custom-shaped out of a large boulder to meet the customer’s needs. Acrylic letters were used to create this entrance sign for Trail Place II subdivision. This 20,000 pound stone sign was placed at a subdivision in east Boise. Rockitecture created this sign from Table Rock Sandstone. Installation was supervised by Rockitecture, and placed by our contracted crane company, Crane Services, who can place signs anywhere from a few feet to 30 feet, depending on the weight of the stone. Table Rock Sandstone blocks were used to raise the height of this stone for Carmel Subdivision. A thin sign was required for this subdivision entrance, and Rockitecture is able to meet those needs by using Table Rock Sandstone quarried by Gerhard Borbonus Landscaping from the Boise foothills. Sometimes Rockitecture will do onsite work, such as this case for Denali Heights, where the landscaper had already set the stone. It is always less expensive to engrave the stone at our facility, but it is possible sometimes to engrave a stone on site. Rockitecture was provided a logo to match for this Table Rock Sandstone Sign in the Boise foothills. It is not always possible to find sandstone with this coloring, but sometimes Rockitecture can provide sandstone with more coloring in it. Rockitecture can work with existing logos, as in this case, to match other existing signage. This uniquely colored stone was provided to us by a customer who purchased this stone from Guthrie Stone on State Street in Boise, ID. 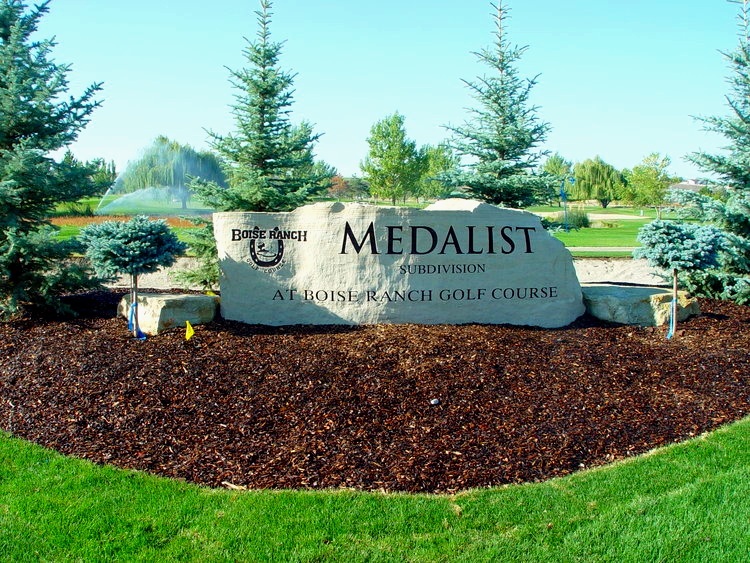 Many different large entrance signs have been provided by Rockitecture to Medalist subdivision with similar logos, but different shapes and sizes. Two stones were used to create this church entrance sign in case the service time needed updated at a later date. Granite was provided to Rockitecture to use for this sign for the LDS Temple in Boise, ID. Rockitecture provided the stone and engraving for this sign. We are also able to provide other painted signs to inset into stone for situations like this where service times may change.